The USD/JPY moved higher while the greenback was generally on the back foot. 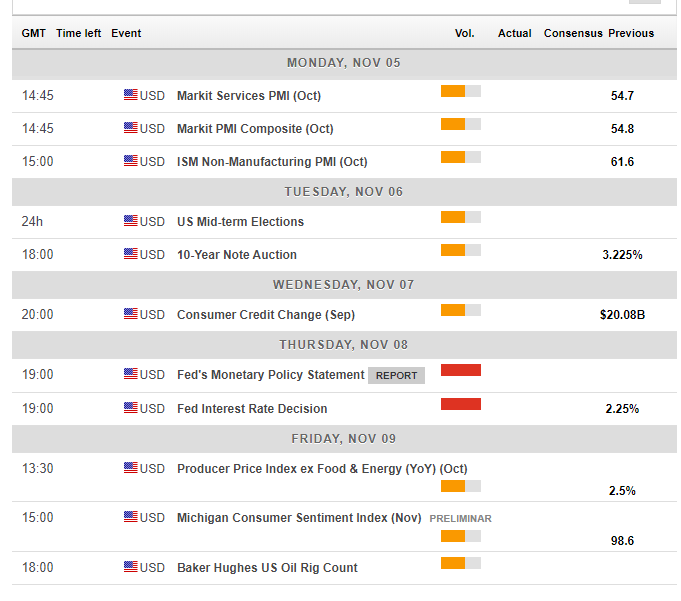 The US Mid-Term Elections and the Fed decision stand out. The technical picture is more balanced for the pair and the FX Poll is mixed as well. US President Donald Trump tweeted about a fruitful conversation with Chinese President Xi Jinping. The phone call came ahead of their meeting at the G-20 Meetings in Buenos Aires later this month. The top topic is trade. The clash between the world's largest economies over Trump's tariffs weighed is already taking its toll on the global economy and has hurt sentiment. The tweet was one of the reasons that stocks finally made a more meaningful recovery. While there were some bumps initially, the US and other stocks recovered. The better market mood pushed both the greenback and the yen lower, but the American currency came out on top. Brexit optimism also helped. 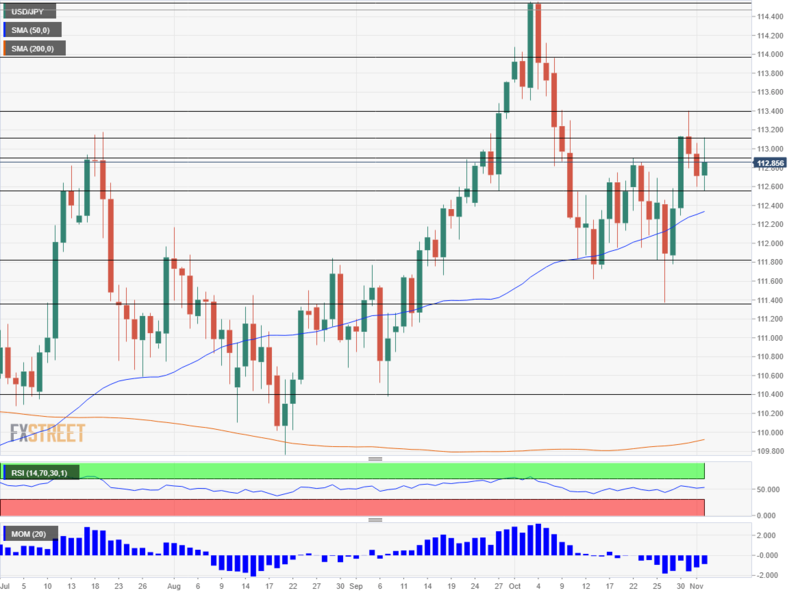 Hopes for reaching an accord on November 21st and even a report that the UK and the EU reached a deal on financial services not only triggered a USD rally but also improved the global mood. On the other hand, the Italian crisis remains in full swing after the euro zone's third-largest economy reported no growth in the third quarter. US data was mixed: the ADP Non-Farm Payrolls beat expectations for October, but it did so also for September's report while the official outcome disappointed. The ISM Manufacturing PMI missed with 57.7, but this remains an upbeat level. The Fed's preferred measure of inflation, the Core PCE Price Index, came out at 2%, as expected. The Non-Farm Payrolls beat expectations with a gain of 250,000 and no downward revisions. And while wages only met expectations, the 3.1% annual wage growth is a significant improvement and the best since 2009. The Bank of Japan left its policy unchanged as expected but had to lower its inflation forecasts, matching them with reality. This somewhat weighed on the yen and is one of the reasons that the greenback came out on top in a bad week for both safe-haven currencies. The ISM Non-Manufacturing PMI is published after the Non-Farm Payrolls this time. While it will not shape expectations, it will have have the full stage to itself. Back in September, the indicator surprised with 61.6 points, an outstanding figure. A slide will likely be seen now. Americans elect a new House of Representatives and 36 Senators on Tuesday. The Mid-Term elections are seen as a referendum on Trump and his policies. According to recent opinion polls, Republicans are set to retain the Senate but lose the House to Democrats. A divided government may limit further tax cuts but could also stop Trump's trade wars. A Democrat victory may weigh on the US Dollar, and if Republicans retain full control, the currency could surge higher. The Federal Reserve will make its rate decision on Thursday for a change, due to the polls. This is the last meeting that does not consist of a press conference. The Fed will likely leave rates unchanged but may open a wide door for a rate hike in December, the fourth this year. The pressures from President Trump to slow down will likely backfire and could only harden the central bank. Fed Chair Jerome Powell and his colleagues see a growing economy, an upbeat job market and increasing but a healthy rate of inflation. Given the political timing, the FOMC Statement will likely consist of very few changes this time. Markets will scrutinize every word. On Friday, the Producer Price Index (PPI) serves as a precursor to the following week's Consumer Price Index (CPI). The University of Michigan's preliminary Consumer Sentiment gauge for November will have the last word for the week, but markets will likely continue digesting the elections and the Fed decision at that point. The weakness of Japan's currency in an upbeat weak only reinforces its status as a safe-haven currency. In case of sentiment turning down once again, the yen may come on top. The yen remains sensitive to stock markets. 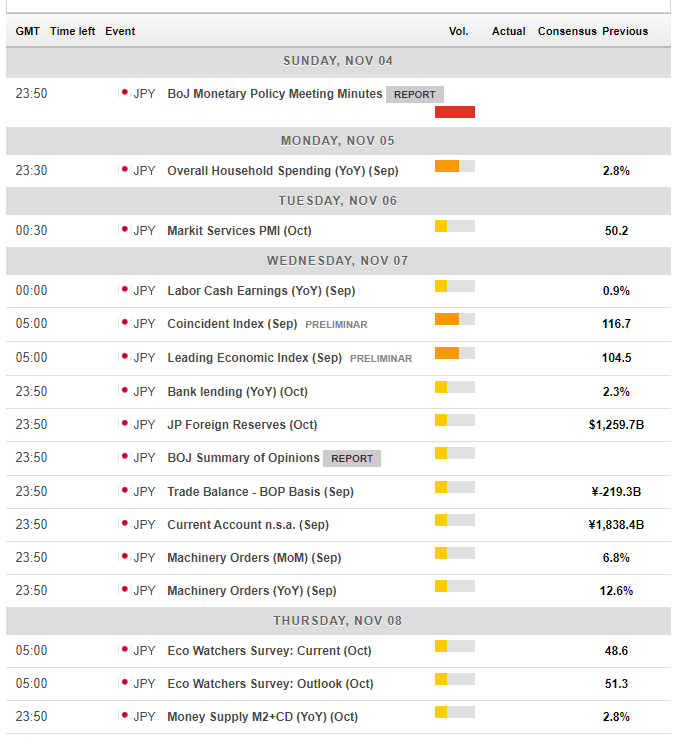 The Bank of Japan dominates the upcoming week among Japanese events. The meeting minutes from the previous rate decision are released early in the week. They will shed some light on the divisions within the Tokyo-based institutions. Not all BOJ members think alike. Household spending rose at a healthy pace of 2.8% in August, and the fresh data for September will likely be similar. Other data points are unlikely to move the yen. The USD/JPY technical picture is balanced. The Relative Strength Index is just around 50. Momentum leans lower but the pair is trading above the 50 Simple Moving Average on the four-hour chart. 112.90 capped the pair in late October. Above, 113.10 was a swing high in early November and also held the pair down in the summer. 113.40 was the peak in late October. Further above, 114.00 is a round number and also a stepping stone on the way up in late September. The 2018 high of 114.60 is next up. 112.55 is was a swing low in early November. 111.80 provided support in late October and capped the pair in August. 111.40 was a swing low in late October. September trough of 110.40 is the next line to watch on the downside. 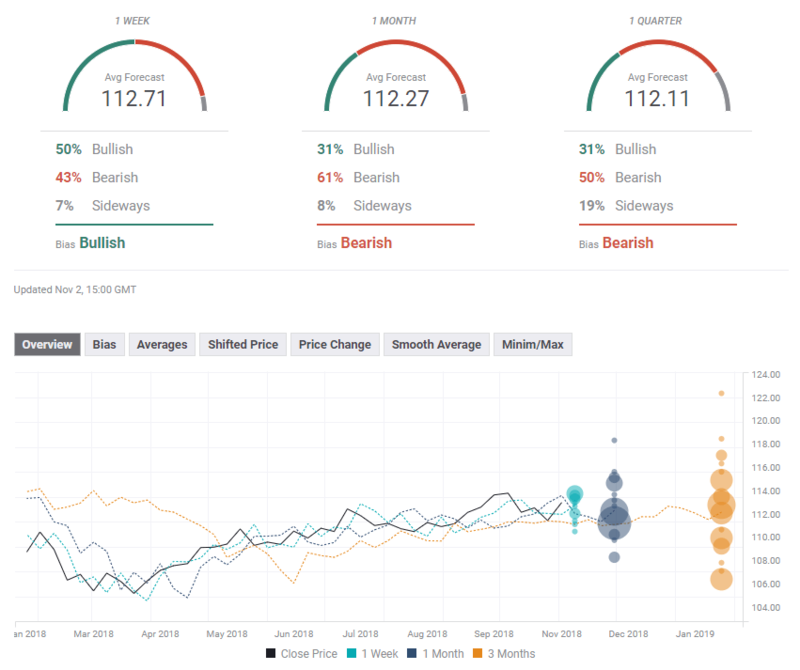 The FXStreet forex poll of experts shows that the short-term outlook is bullish but the bias turns bearish in the medium and long terms. The forecasts have not moved too much in the past week.